Matthew Lange, “Reconstructing the Plummet Machine, Industry City,” 2013. Mixed media, performance, dimensions variable. “Excerpts: Encyclophelia III,” 2011-13. Series of archival inkjet prints, 16 1/2 x 13″. Courtesy of the artist. Photo by Rachel Styer. As an apparatus, in the full critical/theoretical sense of the term, this set of seven archetypal “strata” is a scaffold into which any phenomena can be inserted. For Surviving Sandy Lange set his excavation site against the backdrop of a grid of reproductions from altered encyclopedia pages. 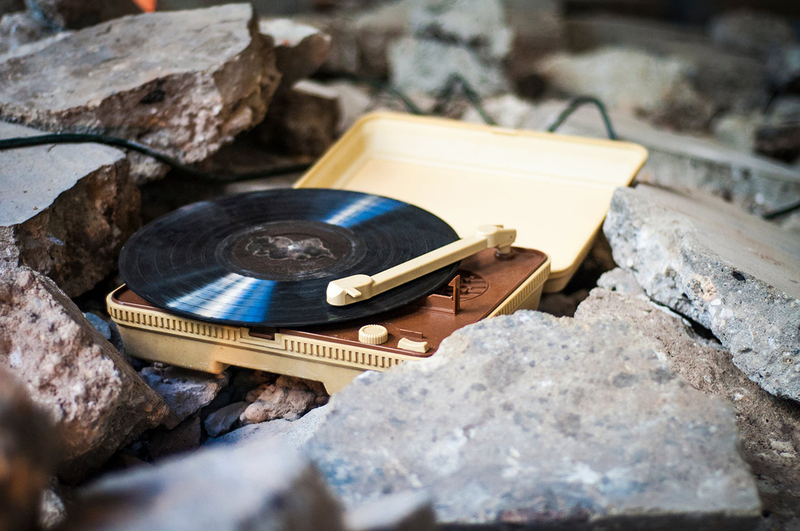 On the opening night of the exhibition, Lange enacted a performance in which he moved about in the cordoned off rubble turning on analogue gadgets such as vintage projectors and portable record players. 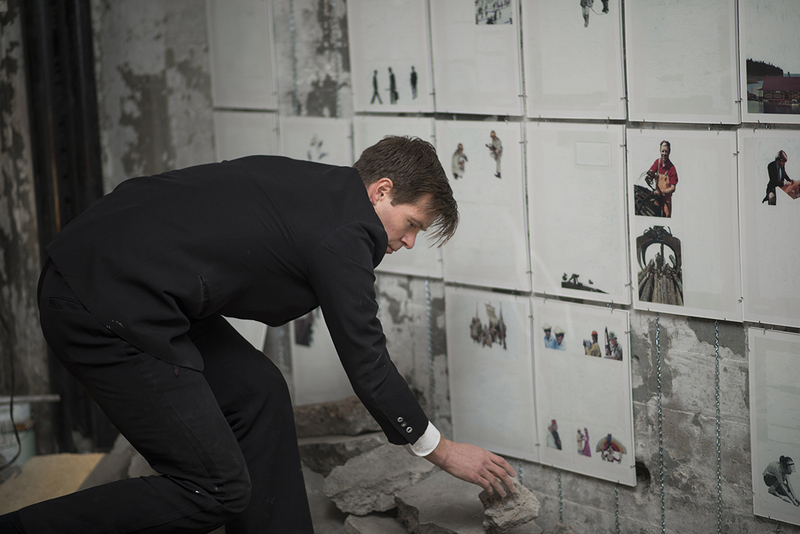 In a self-consciously Beuysian gesture, Lange, wearing a grey suit, wobbles around amidst a square of rubble that he instructed a work crew to leave behind. The rubble pile was partitioned off from the main gallery by a simply constructed wooden railing, not unlike something one would encounter on a nature trail in a national forest. In the forest the weathered wooden structure would have placards bolted to it with faded images of wildlife (woodpeckers, fungi, and rodentia) that one could only hope to catch a glimpse of. The images would be accompanied by bits of concise text which would tell us a thing or two about this or that creature; a fun fact. Matthew Lange performs “Reconstructing the Plummet Machine, Industry City.” December 15, 2013. Photo by Taylor Dafoe. Lange reveals that often theoretical systems are closed circuits and subject to the manipulation of individuals. In this way, he highlights the premise of Foucault’s seminal text The Order of Things. The site of Lange’s performance is given precedent as a locus of shifting power relations from its original use as light industry to its present state as an exhibition space. 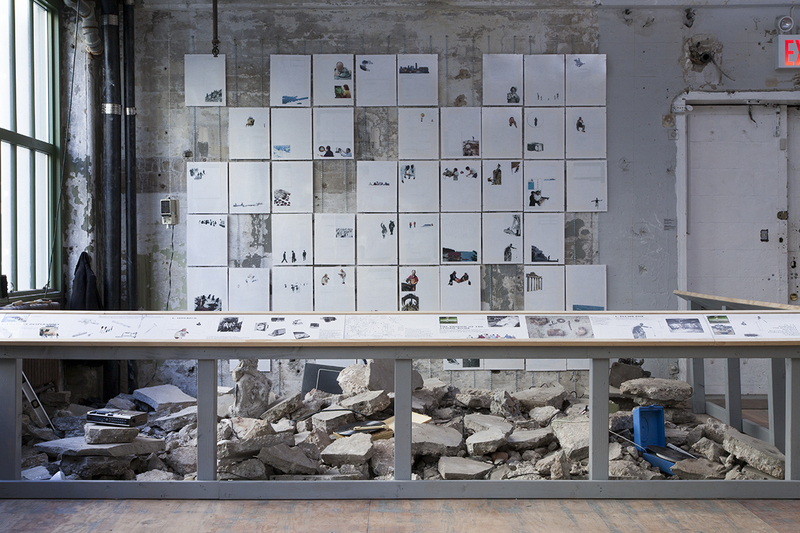 The exposed rubble from the broken concrete floor and the bits of iron and steel from machine parts that were “unearthed” during the site’s renovation for the exhibition bring into focus the fetishism and nostalgia for raw space. Detail of Matthew C. Lange. “Reconstructing the Plummet Machine, Industry City.” 2013. Photo by Taylor Dafoe.